CLICK HERE TO LEARN ABOUT OUR SPECIAL FINANCING OPTION! 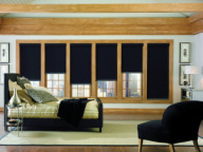 Check out our line of motorized window coverings. 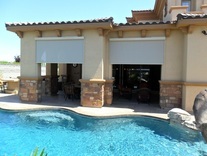 Shades West is the #1 provider of window covering shades and window roller shades in Palm Desert, CA! Serving the entire Coachella valley from Palm Springs to Thermal! Are you looking for the best in roller shades, shutters , retractable awnings , drapes, outdoor drop shades or custom window coverings? If the answer is yes, you have come to the right place! Shades West offers a wide range of the best window roller shades, window shutters, motorized shades, window blinds and much more! Our pricing is very affordable, and our promise to you is that we will never cut corners when providing your home or office with only the best in window coverings from manufacturers such as Hunter Douglas®, Lafayette Interior Fashions® and Norman Shutters®. ​Our reputation for excellence and great customer service has contributed to our receiving a "The Top 100 In Sales" award from Lafayette Interior Fashions for five years in a row and counting! The secret to our success is fairly simple but, unfortunately for our competitors, not often replicated well: outstanding customer service and only the best products! 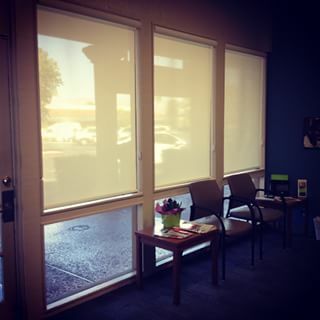 As an award winning window shade provider in the Palm Springs area, we have added a touch of style, elegance and sophistication to a large number of our customer’s homes and offices. We love framing the view of the beauty of the deserts we live in to enjoy the amazing sights from within our area homes and businesses, and want to share that passion with you! No matter what your needs are, no matter what you budget is,Shades West has the right window covering for your home or office. We can provide you with the best custom window coverings for a luxury home in Palm Desert or give your office a more professional look with motorized window shades. We are a fully licensed, certified and insured. No matter what your need is, whether for shades, shutters, blinds or any of the other amazing products we offer at a great price! Our customer service doesn’t end upon completion , we are always here if you need service. 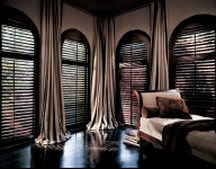 Shades West is the best window covering dealer in Palm Desert and is ranked #2 in the U.S. for Window Coverings. This high national ranking for window coverings is not by accident, but by ensuring that we only offer the best brands and installation while remaining affordable and having a reputation for treating our customers and their homes with complete respect. Home window decoration, it’s not just blinds & shades, shutters, drapery, curtains. In this new day and age of remodeling and fixs and flips window decor has taken on a whole new approach to window coverings, shades, shutters blinds, drapes. Custom window coverings are now an art form, an experience, a look through a desert window is now a new memory being created. 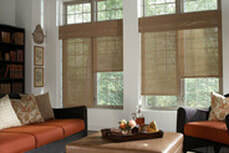 Shades and drapes and window blinds are being matched to an experience the owner wants his or her guest to have. Shades are now a cover to a baby’s afternoon nap. Roller window shades are no longer your mother’s old drab pull down shades, there are window covering shades with splashes of color and personality. Curtain shades just don’t sit around and collect dust any more, organic materials and allergy safe materials are popping up for a healthy living space, giving the words custom drapes a real meaning. ​Roller window shades are now custom window roller shades; you pick the direction you want to go in and separate your windows shades from every house on the block. So, the next time you think of window draperies, think outside the box, and see where your imagination takes you. Mid-Century Modern homes in Palm Springs, California have been trending for roller shades and are a huge energy saver , especially in the summer. • Shades and Drapes: Shades West has a large selection of window shades and drapes, and specialize in custom and large windows designs to fit every need affordably and with ease. • Shutters: Shutters can be a great accent and investment to any home or business, call us today to speak with one of our experts about how we can add this great option to your property! • Outdoor Shades: A great addition to a sparkling pool, a relaxing patio or any other outdoor area, outdoor drop shades can help to create an atmosphere of style and comfort to your outdoor space! • Outdoor retractable Awnings : An outdoor awning can be an asset to any home, both for parties as well as a way to shade your pool to reduce the effects of the California sun on you and your family! 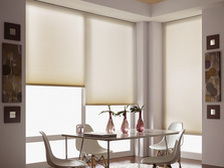 • Motorized Shades: For the ultimate in convenience and style, custom motorized shades add a level of sophistication and luxury to any home or office in Palm Desert! 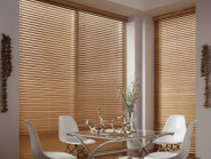 • Wood Blinds: Combining a natural look with the convenience and energy savings that blinds provide, wood blinds can be a great choice for your window coverings. • SHEER VISIONS® VERTICALS: For an elegant and graceful window covering option, SHEER VISIONS® VERTICALS offer a designer look without breaking the bank when you choose Shades West for your dealer and window covering installation! 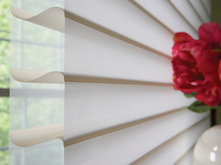 There are many benefits to having drapes, shades, shutters and blinds in your home or office here in California! 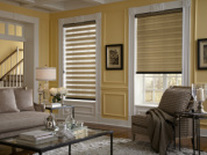 From a style perspective, the right drapes combined with accenting shades can bring a room together like nothing else! With the ability to choose the level of natural light you want to let in, custom window coverings allow you to decide the look of your room at various times during the day. Drapes in particular, beyond their interior design benefits, allow you a greater measure of control over the internal temperature of your home. This fact also means that your energy bill will be more under your control as drapes offer excellent insulation for both heating and cooling!